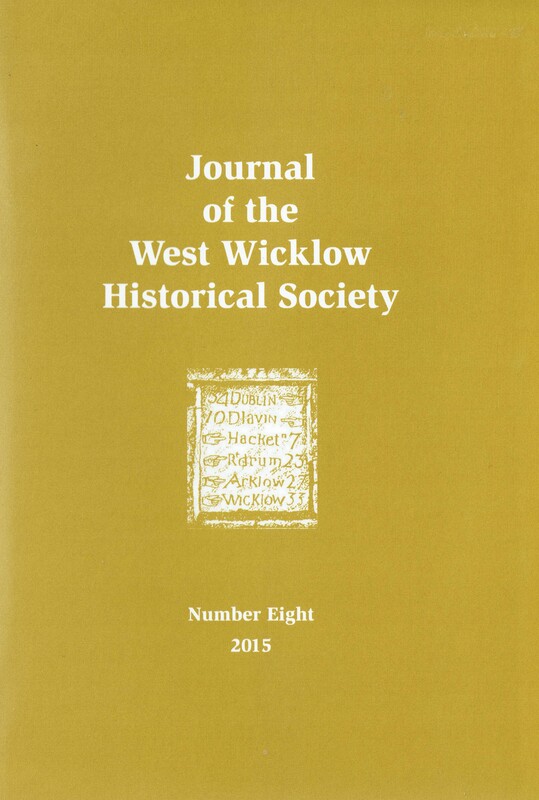 Publisher / Place of Publication: West Wicklow Historical Society / Baltinglass (? ), Co. Wicklow. 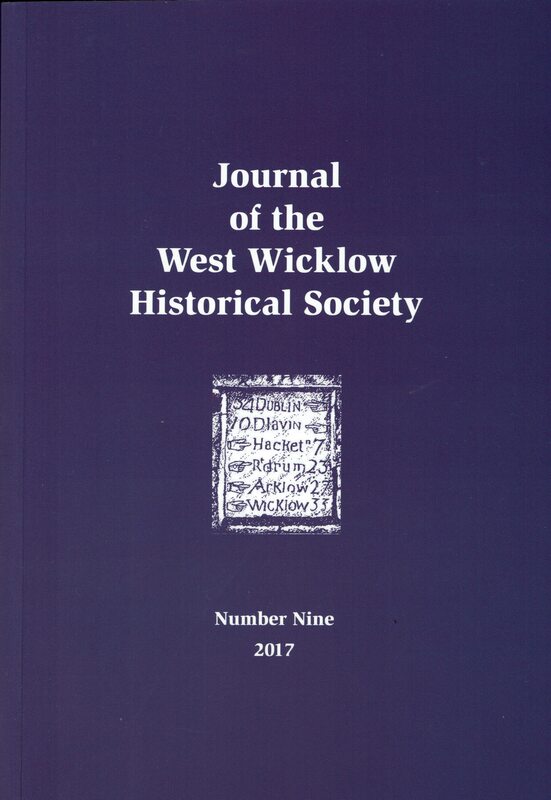 About: This ninth publication of a set of articles on aspects of West Wicklow history is the most substantial yet with articles of the highest quality. A diverse range of topics is covered from medieval stone lamps and sheep wash-holes to the Plymouth Brethren and railway accidents. The most extensive article in this issue is by Chris Lawlor which looks at the impact of the Civil War on ordinary citizens as reflected in compensation claim records. Overall this publication makes a most appealing Christmas stocking-filler for anyone interested in West Wicklow history. Contents: Foreword from the Chairman / John A. O’Toole — Ramblings of the Secretary / Donal McDonnell — Editor’s Preface / Chris Lawlor — Archaeological excavation on Baltinglass Hill – Lathaleere – the evolution of a place-name / Paul Gorry — Death in the Glen of Imaal – 16th September 1941 / James Scannell — The Plymouth Brethren and the Baltinglass connection / Cora Crampton – The Boyestowne Lordship: Baltyboys, Tulfarris & Humphreystown 1650-1850 [Part One] / Brendan Corrigan — County Wicklow Grand Jury 1793 – William Hanbidge’s recollections of wool-weaving in the 1820’s / John Hussey — A light into medieval Ireland: some thoughts on cresset-stones and a previously undocumented example from Newry townland, southwest Wicklow / Lorcan Harney — Denis Gavin and Ellen Murphy: early Queensland pioneers / Pauleen Cass — Odd fish in West Wicklow / Christopher Moriarty — Sheep wash-holes in West Wicklow / Seamus Balfe and John Hussey — A fatal accident on the Dublin & Blessington tram line in 1912 / James Scannell — Ernest Molyneux of The Decoy / Tom Molyneux – Tuckmills in West Wicklow / John Hussey — Trouble with the points / James Scannell – Three men and a (little) mountain / Brian McCabe – Raids, requisitions and recompense: the Civil War’s impact on West Wicklow, 1922-3 / Chris Lawlor – Review: Brendan Corrigan’s The History of Hollywood Co Wicklow / John Glennon. Extra #1: Illustrated throughout with black & white photographs, maps, drawings and graphs. 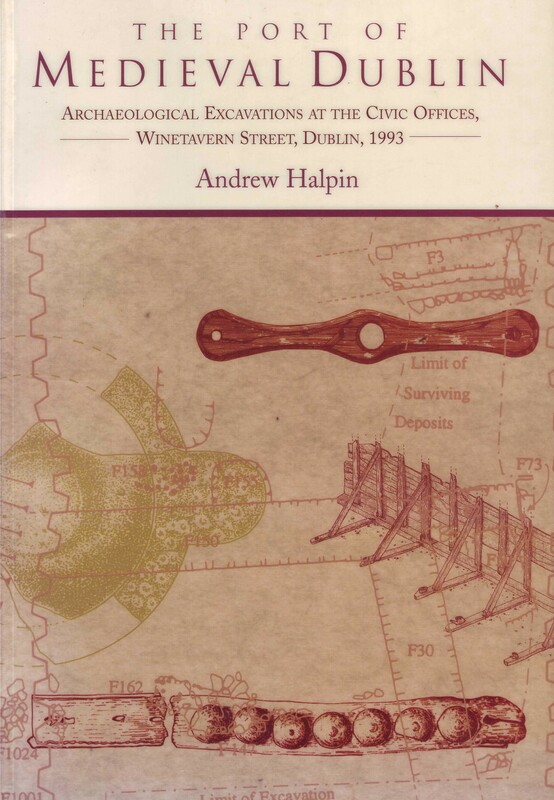 Creator / Author: Andrew Halpin, with contributions by Aidan O’Sullivan and others. Publisher / Place of Publication: Four Courts Press Ltd. / Fumbally Court, Fumbally Lane, Dublin 8. About: This book is a detailed account of archaeological investigations that took place during the second phase of the construction of the Civic Offices of Dublin Corporation at Wood Quay. Specifically this dig took place at the proposed location of the car park and uncovered evidence of 12th and 13th century activities at the site. Chapters: Introduction — Historical background — Stratigraphy of the site — The wooden waterfronts: a study of their construction, carpentry and use of trees and woodlands / Aidan O’Sullivan — Dendrochronological analysis of oak wood samples – Analysis of sediment samples — The medieval pottery — Medieval boat and ship timbers / Aidan O’Sullivan — Building materials: architectural fragments, roofing tiles and slates, floor tiles — The leather finds — The small finds: stone, metal, wood, bone and antler. Stone artefacts – Wooden artefacts / Aiden O’Sullivan and Mary Deevy — Metal artefacts – Artefacts of bone and antler – Conclusions – Bibliography. WW Connection #1: Aidan O’Sullivan is a native of Valleymount in West Wicklow. Extra #1: includes maps, plans, photographs and illustrations. About: This eighth publication of a set of articles on aspects of West Wicklow history is the biggest issue yet. The articles span the centuries from c.1000 BC to modern times and feature locations from Hollywood to New South Wales. The most extensive article in this issue is by James O’Driscoll and concerns itself with the hillforts of the Baltinglass area and the techniques used in their construction. Contents: A word from the Chairman / Noel Lyons — Ramblings of the Secretary / Donal McDonnell — Editor’s Preface / Chris Lawlor — Tubber and the Castle Leslie connection: an overview of Tubber House and Demesne c. 1764-1824 / Emma Lyons – Hillfort construction at Baltinglass: building Ireland’s hillfort capital / James O’Driscoll — From crime to wine: The Claytons of New South Wales / Margaret Smith — Robert Pipho and the Baltinglass Rebellion / Brendan Corrigan — ‘Yes, this is Wicklow’: recovering George Francis Savage-Armstrong as a poet of Wicklow / Rosemary Raughter – Not so doddery: the Dunlavin solicitor, Mr. Dodd / Declan O’Connor — A Black and Tan executed / D.J. Kelly — A famous row between two publicans in 1886 / John Glennon — Rathdangan and Killamoate: my native area / Peadar C. Ó Cuilinn — In the shadow of Joseph Holt / Henry Austin — Death on a country road / James Scannell — Poor men and poor women / Joe McArdle – Two August 1911 cycling mishaps / James Scannell — The Dunlavin massacre: two ballads of 1798 / Chris Lawlor. Extra #1: Illustrated throughout with black & white photographs, maps and drawings. About: This is an account of an excavation at the ancient graveyard of Killeen Cormac, near Dunlavin which took place around Easter in 1929. The excavation discounts an earlier theory that the mound-shaped cemetery contained chambers of pre-historic origin. Likewise, no evidence was found for the presence of a church. The authors then concentrated on various pillar-stones, some with Ogham inscriptions and some without as well as slabstones with cross designs. Detailed descriptions are provided for each of the examples given. Extra #1: includes plan of the cemetery, illustrations and four pages of photographs. Extra #3: Read the article online via the JSTOR. [Personal registration / conditions apply]. Alternatively, your local public library may provide free online access to this article. About: In 1932, the authors excavated an ancient mound at Haylands, near Blessington and discovered a Bronze Age burial. This prompted them to investigate similar burials that were recorded for the locality and to carry out a review of all Stone Age and Bronze Age monuments and objects to be found in the wider barony of Lower Talbotstown. .Extra #3: Check OCLC WorldCat.org for this publication in libraries worldwide. Publisher / Place of Publication: National Roads Authority / St. Martin’s House, Waterloo Road, Dublin 4. 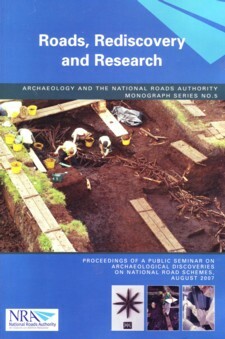 About: This 10-page conference paper (pp117-126) describes how historical sources such as maps and documents can be used to validate and illuminate the archaeological discoveries that were made on the Clonee to North of Kells section of the M3 motorway scheme. WW Connection #1: The author is a native of Baltinglass in West Wicklow. Extra #1: includes photographs, a map and plan. About: A 10-page essay which links ancient pilgrimage and his own family history. The author reflects on family visits to Glendalough and the hill places to be found on the way from Valleymount. A centrepiece of the essay is a description of Templeteenaun, a medieval church site which the author (by now an archaeologist) was later to excavate. WW Connection #1: Author Aidan O’Sullivan is a native of Valleymount in West Wicklow.